An overview to the enhanced AAI theory version 2 you can find here. In this post we talk about the blueprint of the whole AAI analysis process in the top-down version. 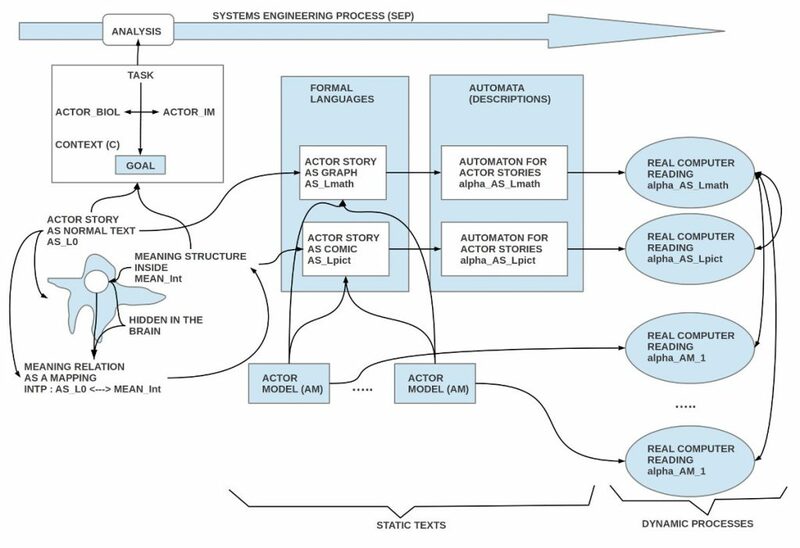 Here I leave out the topic of actor models (AM) and the topic of simulation. For these topics see other posts. Blueprint of the whole AAI analysis process including the epistemological assumptions. Not shown here is the whole topic of actor models (AM) and as well simulation. 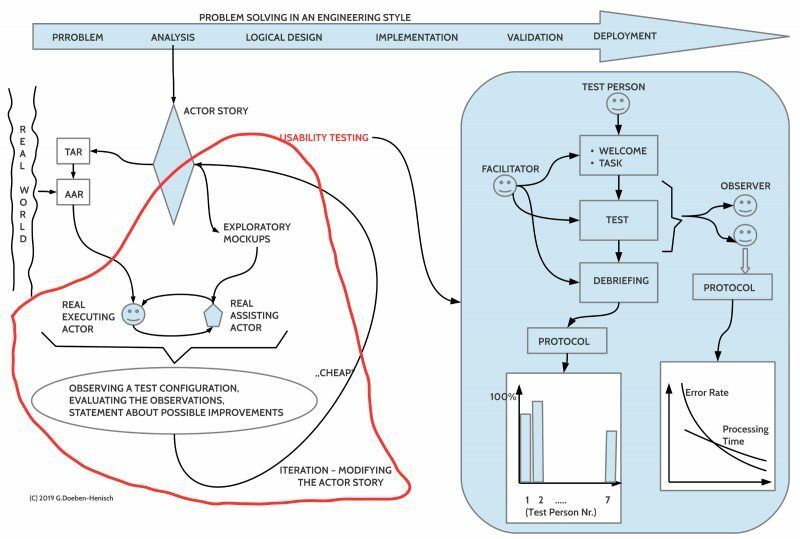 The Actor-Actor Interaction (AAI) analysis is understood here as part of an embracing systems engineering process (SEP), which starts with the statement of a problem (P) which includes a vision (V) of an improved alternative situation. It has then to be analyzed how such a new improved situation S+ looks like; how one can realize certain tasks (T) in an improved way. The driving actors for such an AAI analysis are some stakeholders which communicate a problem P and a vision V and some experts with at least some AAI experts, which take the lead in the process of elaborating the vision. It has to be taken into account that the driving actors are able to do this job because they have in their bodies brains (BRs) which in turn include some consciousness (CNS). The processes and states beyond the consciousness are here called ‘unconscious‘ and the set of all these unconscious processes is called ‘the Unconsciousness’ (UCNS). An important set of substructures of the unconsciousness are those which enable symbolic language systems with so-called expressions (L) on one side and so-called non-expressions (~L) on the other. Embedded in a meaning relation (MNR) does the set of non-expressions ~L function as the meaning (MEAN) of the expressions L, written as a mapping MNR: L <—> ~L. Depending from the involved sensors the expressions L can occur either as acoustic events L_spk, or as visual patterns written L_txt or visual patterns as pictures L_pict or even in other formats, which will not discussed here. The non-expressions can occur in every format which the brain can handle. While written (symbolic) expressions L are only associated with the intended meaning through encoded mappings in the brain, the spoken expressions L_spk as well as the pictorial ones L_pict can show some similarities with the intended meaning. Within acoustic expressions one can ‘imitate‘ some sounds which are part of a meaning; even more can the pictorial expressions ‘imitate‘ the visual experience of the intended meaning to a high degree, but clearly not every kind of meaning. Because the space of possible problems and visions it nearly infinite large one has to define for a certain process the problem of the actual process together with the vision of a ‘better state of the affairs’. This is realized by a description of he problem in a problem document D_p as well as in a vision statement D_v. Because usually a vision is not without a given context one has to add all the constraints (C) which have to be taken into account for the possible solution. Examples of constraints are ‘non-functional requirements’ (NFRs) like “safety” or “real time” or “without barriers” (for handicapped people). If the AAI check has been successful and there is at least one task T to be done in an assumed environment ENV and there are at least one executing actor A_exec in this task as well as an assisting actor A_ass then the AAI analysis can start. The main task is to elaborate a complete description of a process which includes a start state S* and a goal state S+, where the participating executive actors A_exec can reach the goal state S+ by doing some actions. While the imagined process p_v is a virtual (= cognitive/ mental) model of an intended real process p_e, this intended virtual model p_e can only be communicated by a symbolic expressions L embedded in a meaning relation. Thus the elaboration/ construction of the intended process will be realized by using appropriate expressions L embedded in a meaning relation. 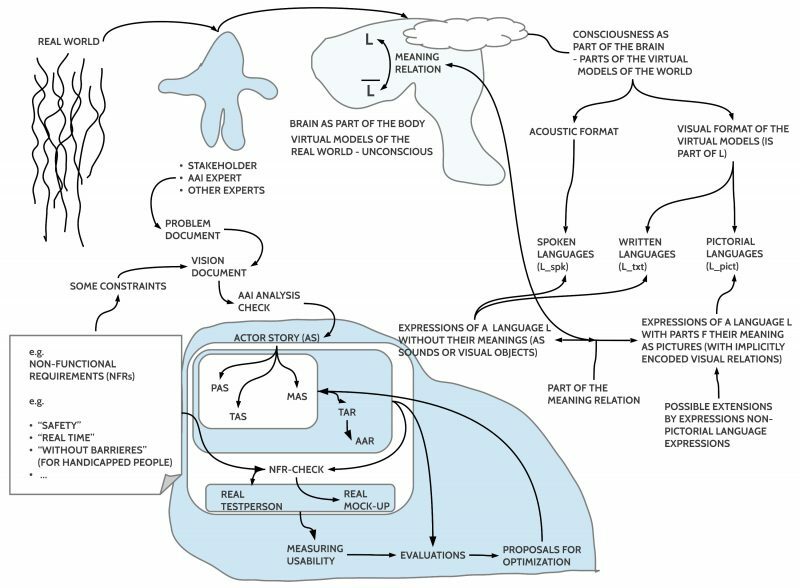 This can be understood as a basic mapping of sensor based perceptions of the supposed real world into some abstract virtual structures automatically (unconsciously) computed by the brain. A special kind of this mapping is the case of measurement. In this text especially three types of symbolic expressions L will be used: (i) pictorial expressions L_pict, (ii) textual expressions of a natural language L_txt, and (iii) textual expressions of a mathematical language L_math. The meaning part of these symbolic expressions as well as the expressions itself will be called here an actor story (AS) with the different modes pictorial AS (PAS), textual AS (TAS), as well as mathematical AS (MAS). If the actor story is completed (in a certain version v_i) then one can extract from the story the input-output profiles of every participating actor. This list represents the task-induced actor requirements (TAR). If one is looking for concrete real persons for doing the job of an executing actor the TAR can be used as a benchmark for assessing candidates for this job. The profiles of the real persons are called here actor-actor induced requirements (AAR), that is the real profile compared with the ideal profile of the TAR. If the ‘distance’ between AAR and TAR is below some threshold then the candidate has either to be rejected or one can offer some training to improve his AAR; the other option is to change the conditions of the TAR in a way that the TAR is more closer to the AARs. The TAR is valid for the executive actors as well as for the assisting actors A_ass. If the actor story has in some version V_i a certain completion one has to check whether the different constraints which accompany the vision document are satisfied through the story: AS_vi |- C.
Such an evaluation is only possible if the constraints can be interpreted with regard to the actor story AS in version vi in a way, that the constraints can be decided. 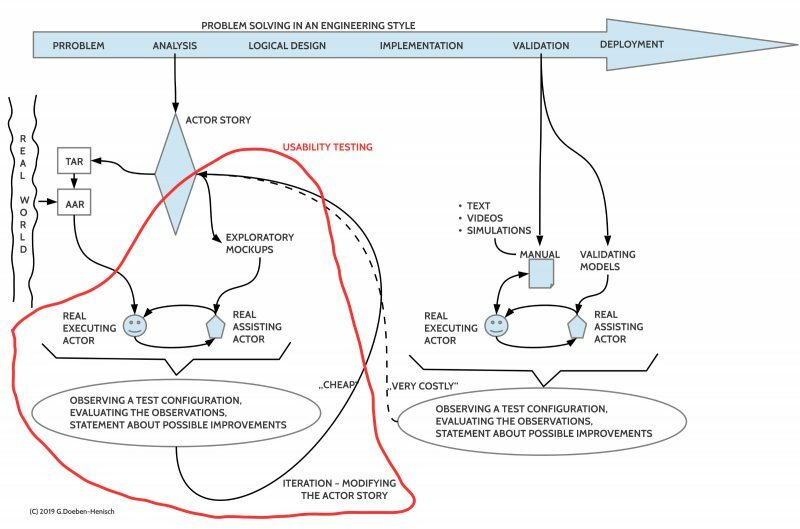 For many constraints it can happen that the constraints can not or not completely be decided on the level of the actor story but only in a later phase of the systems engineering process, when the actor story will be implemented in software and hardware. Using the actor story as a benchmark one can test the quality of the usability of the whole process by doing usability tests.